Garden City, N.Y. – On Monday, October 21st, the first Teaching with Technology Day was held at the Cradle of Aviation Museum. 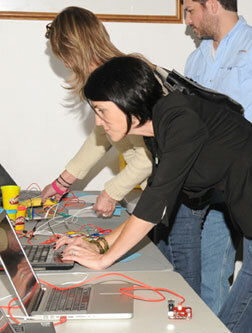 Teaching with Technology Day is a professional development opportunity open to all Long Island educators. Educators attended hands-on, interactive workshops delivered by prominent education technology companies to encourage the use of technology in their class curriculum. Over 100 educators were immersed in new technology tools and the latest software to help bridge the gap between the virtual classroom and the physical classroom. Presenters focused on how technology can be utilized to create an engaged learning environment for their students. Participating school districts included: Hempstead, Sachem, Wyandanch, East Williston, Commack, Bellmore-Merrick, and several schools from the Diocese of Rockville Centre. Teaching with Technology Day is just one of the many professional development offerings produced by the Cradle of Aviation Museum. The Cradle is home to over 75 planes and spacecraft and is located on Charles Lindbergh Blvd., on the Garden City/Uniondale border.